The renowned developer ATS Greens has come up with a premium project ATS Le Grandiose in sector 150, Noida. This lavishing development by the group offers premium luxury and comfort that you will love. You will definitely fall in love with these apartments. Walk up to beautifully landscaped surroundings, take a refreshing morning walk, stretch out on the verdant greens doing Yoga and relax while having a dip in the magnificent swimming pool, this is all there at this development waiting for you. Extended over 18 acres of land, this residential development contains 13 towers offering 3 and 4 BHK apartments of different configurations, which are being crafted to perfection. The apartment area size starts from 1492 sq. ft. and going up to 2166 sq. ft., filled with world-class interiors and stylish fittings. This is a grand development that focuses on luxury and comfort and lets you enjoy life at fullest. This lavishing development delights the habitats with a luxurious lifestyle in the environment-friendly settings. There are 500 units in total and there is split AC provisions in the living room, bedroom and dining area. The apartments are spacious, providing ample natural light and cross-ventilation and contain luxury furnishings, vitrified and marble flooring, elegant kitchens, and high-quality electrical points providing beautiful landscapes, high-tech safety measures and more. The development offers Earthquake-resistant RCC framed structure and fully gated complex with 24 x 7 video security. 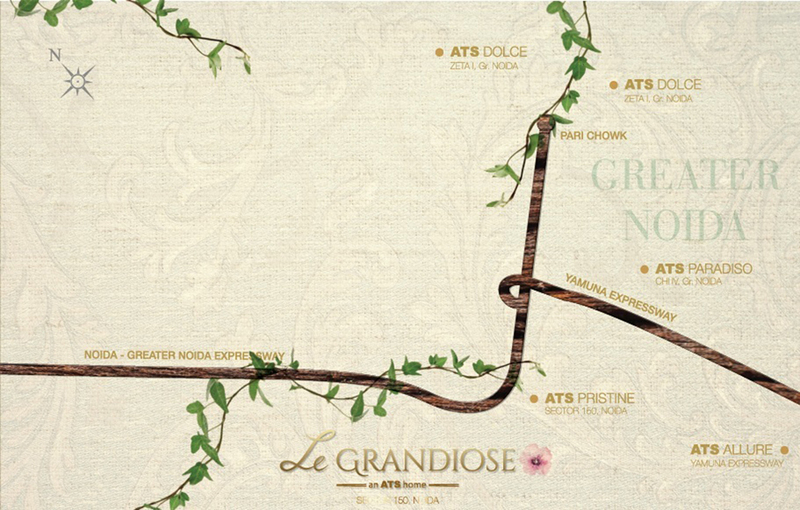 ATS Le Grandiose Sector 150 offers world-class amenities to the residents to make their life comfortable. The development is designed in a way keeping all your requirements and taste in mind. Get ready to rejuvenate yourself at this development, and reclaim the essential harmony of body, soul, and mind. ATS Le Grandiose Amenities include fully-equipped gymnasium, jogging track, badminton court, high-tech security system, clubhouse, swimming pool, multipurpose hall, yoga room, multiple sports facilities, power backup, high-speed elevators, kids’ play area, banquet hall, indoor and outdoor sports activities, fire frightening system , CCTV surveillance, Intercom facility and more. There are a grocery shop and shopping center inside the complex for your daily needs. What are the Location Benefits? Located at Sector 150, Noida, this development comes in close proximity to a number of everyday and emergency places which you can easily access without worrying about the long journeys. The project is also close to fabulous Gold Course and huge Central Park. From top schools to universities, to medical centers, hospitals, banks, ATMs, corporate houses, shopping malls, supermarkets and social amenities, you will truly appreciate your experience here. The location map also shows that the bustling areas of Sector 62 Noida and Pari Chowk are just a short walk away from this development. The project location also offers great connectivity to Noida-Greater Noida Expressway and Yamuna Expressway. There is also a proposed metro station in the close vicinity. The project is well-connected to Delhi NCR and nearby areas through road network and different modes of transportation. The project enjoys all the location advantages that make it very desirable and much in demand. The price for the apartments starts at Rs. 1.32 crs which further extends to Rs. 1.81 crores, as per the apartment size and configurations. 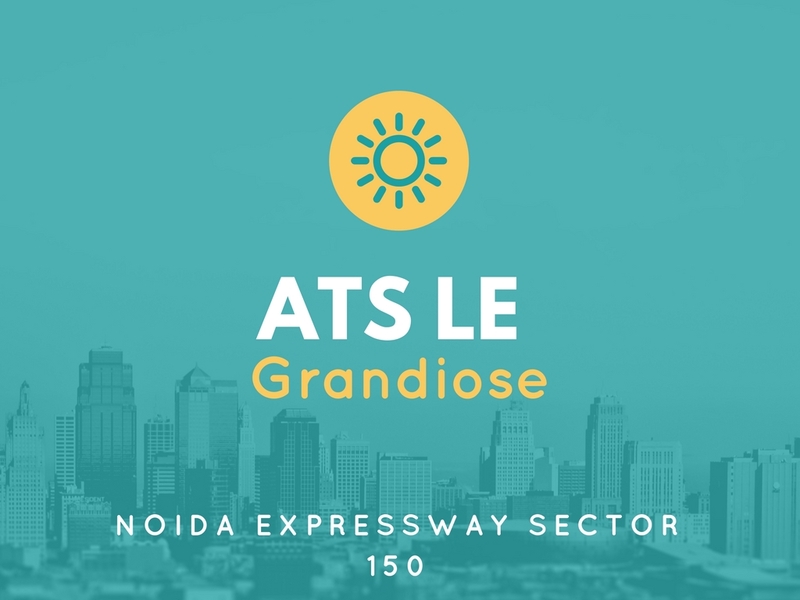 ATS Le Grandiose price is really affordable and definitely worth for the glorious features and amenities that it is offering. Without a doubt, buying an apartment at this luxurious development is worth a purchase that will offer great returns in future. There are different payment plans to choose from, along with the easy home facilities at low-interest rates to make your purchase easier. 5 min drive to Pari Chowk Gr. Noida. 5 min dive to Yamuna Expressway.